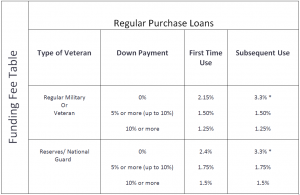 Home buyers interested in a new VA purchase or refinance loan will find the latest 2019 VA Funding Fee Chart below. Veterans who qualify as 10% (or greater) disabled as a result of active military service are NOT required to pay a funding fee. The VA funding fee may be paid in cash or it may be included in the home buyers mortgage. VA does not require a monthly mortgage insurance (PMI) charge, only the one-time funding fee. Again, the funding fee chart applies to all VA home purchases, VA Jumbo Loan, 100% cash out refinance, streamline and VA IRRRL refinance transactions. Applicants can also read the complete 2019 VA Loan Guidelines here. Please contact us 7 days a week with questions by calling the number above, or just submit the Info Request Form on this page.